Homepage Traditional Wear An Extensive Guide To Style Your Men’s Sherwani! These days everyone wants to look different from the crowd and make a style statement. Well, not only women but men also have a wide variety of clothes to choose from. Indian clothes are known for their elegance and intricate work. 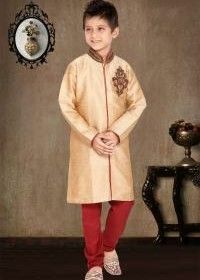 Men have a wide variety of options to choose from in Indian clothing like kurta pajamas, sherwanis, Nehru jackets, dhoti kurta, etc. Kurta pajamas are known for their comfort level but sherwanis steal the show with their royal look. For weddings occasions, sherwanis are the best bet. Men’s sherwani is no longer just about golden embroidery and jazzy churidars, several different prints and works are now added to sherwanis. Unique colour combinations take the centre stage these days when it comes to adding an element of style to a is worn for wedding occasions but you can select a subtle sherwani for a casual event too. Even the styling of the sherwani should be done based on the event. Apart from trying new patterns and designs on the sherwani, you can also try and go for unique bottom styles. Sherwanis are available in several fabrics and each fabric gives a unique look to the attire. Before styling a men’s sherwani it is necessary to choose the right one. Here are some tips to select the right sherwani. Each fabric has its own look and texture and it is essential to choose the one which suits your style and comfort level. Materials like velvet, jacquard silk and cotton are commonly used for sherwanis. Consider the season of the event before selecting the material. Additionally, if you are planning to opt for heavy embellishments on your sherwani then see to it that the fabric is good enough to support the same. Sherwanis need to be of a proper fit and are a bit body defining in general. Along with the fit, even the length of the sherwani needs to be proper. Typically, a men’s sherwani falls just below the knees. Sherwanis need to look crisp and formal, unlike kurtas which are casual in their look. Many times, the fabric also influences the fit of the attire. The combination of a sherwani and churidar needs to be in sync colour wise. Wedding sherwanis usually come in the tones of red, blue and green. However, not everyone is a fan of these mundane colours. These days men are quite open to trying new colours like peach, mint blue, beige, bright pink, etc. Make sure you add some newness to your overall look by going for a unique colour combination. Sherwanis are generally worn with churidars but in order to give the overall sherwani a new twist, different bottom styles can also be worn. Apart from a churidar, you can also go for bottoms like straight-fit trouser pants, dhoti, pyjama, etc. 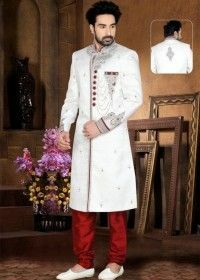 A perfectly styled men’s sherwani adds charm and elegance to your personality. Indian outfits look impeccable with accessories and even men can don a few statement pieces to enhance the look. It is also necessary to carry this attire well. Here are some tips to style your sherwani. Footwear plays a vital role in all Indian clothes. Make sure you complete your traditional look with appropriate footwear. 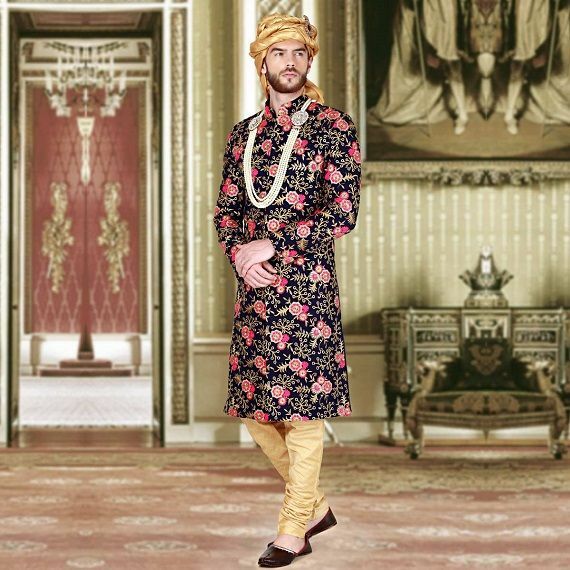 Go for styles like mojris, kolhapuri flats or loafers when wearing a sherwani. Additionally, one must also concentrate on the tone of the footwear. It is best to go for colours like brown, beige, black, cream, grey, etc. because they blend with all kinds of sherwanis. Floral sherwanis are very much in trend these days. Sherwanis with a floral print are generally chosen in bright tones like pink, yellow, orange, blue, white, etc. In order to add some glamour to the sherwani, you can add a lapel pin. Lapel pins look modern and are easy to place too. Lapel pins are available in several tones and designs. Lapel pins look apt when paired with plain or floral sherwanis. Sherwanis look all the more complete with a dupatta. Several Indian outfits can be paired with a dupatta like kurta pajamas, dhoti kurtas, etc. The same also goes for a men’s sherwani. One can opt for a contrast dupatta too. If your sherwani is dark in colour then you can team it up with a light coloured dupatta. Likewise, dupattas with golden and silver tones are also quite in. 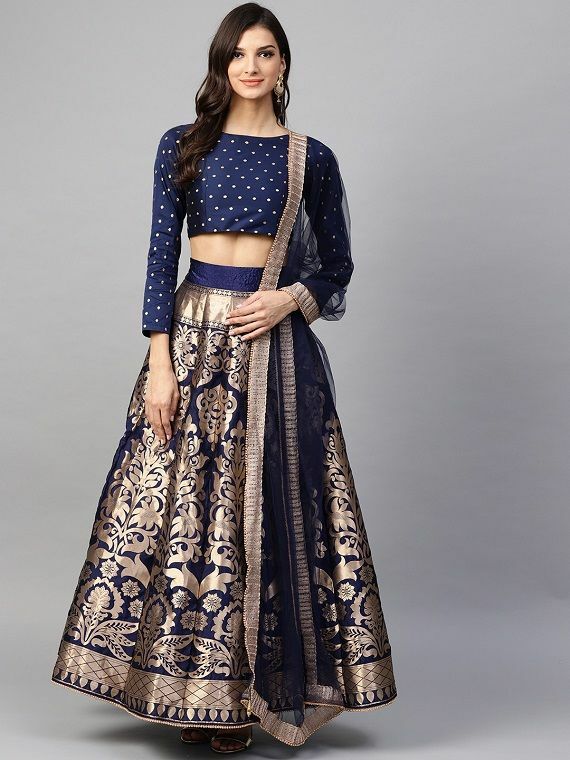 Embellished sherwanis are quite common for wedding events but in order to experiment, one can also try and opt for floral prints, brocade work, thread work, mirror work, etc. Using unique colour combinations for embroideries can also give your sherwani a new look. 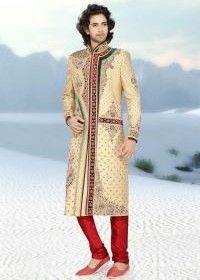 No matter what kind of work you choose for your sherwani, see to it that you don’t go overboard with too many elements. A pocket square is apt for enhancing the look of a sherwani. Pocket squares are available in all shades these days. Pocket squares look extremely good on plain coloured sherwanis and floral sherwanis. Shopping for Indian clothes is a tough task. It is best to purchase Indian outfits online. 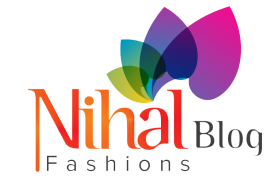 Nihal Fashions is one of the most preferred online shopping hubs for Indian clothing. This online fashion store has something for everyone like kurta pajamas, sherwanis, lehenga cholis, gowns, salwar kameez, sarees, etc. Also, don’t forget to check their festive offers and discounts. 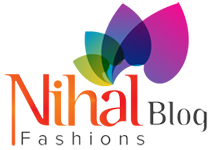 Known for its amazing quality and latest varieties, Nihal Fashions is your go-to online store!